Okay, everyone knows about Google but Google+ and Google Places is still a mystery for many people. It may become a bit simpler because the rumor is that Google Places is slowly being replaced by Google+ Local. Or did that just complicate things? Let’s start over. Google has launched new search results that include the usual title, web link, and brief description, but now adds the address, phone number, shows the location on a map, a link to reviews, and a Zagat ranking on a scale of 1 to 30. 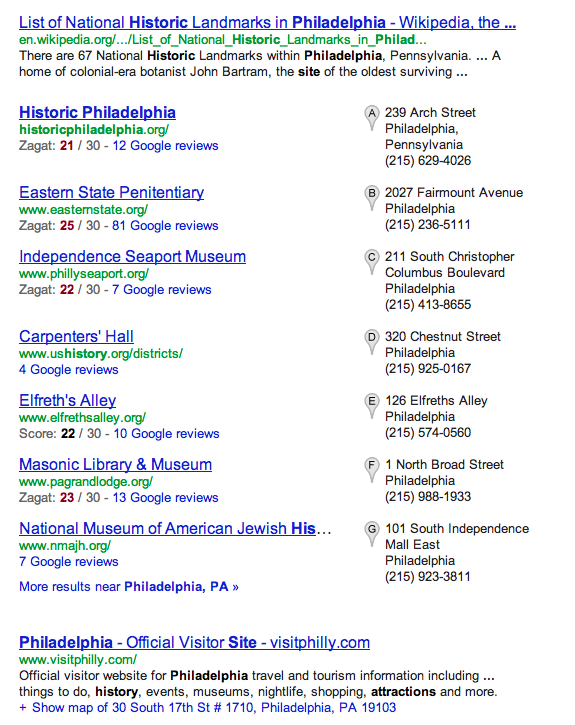 In the example to the left, you’ll see the search results for “historic sites in Philadelphia” and that the Eastern State Penitentiary (the third item) received a Zagat rating of 25 (it really is an amazing place) and has 81 Google reviews (wow! their visitors have opinions). This new form of listing doesn’t occur for every city, just those that seem to have enough places to warrant them (right now, this list appears for Denver but not San Francisco). Local information is being integrated across Google (including the Zagat ratings, which was acquired by Google last year), so you’ll find it not only on web searches but also maps. Google has also created a page for your site or museum. Automatically. Without your knowledge. And it’s pretty revealing. Don’t be afraid. It’s simply a compilation of information, images, and reviews already on the web but pulled together in one place called Google+ Local (see example to the right). They also create some “at a glance” terms to summarize the experience or place. For the Eastern State Penitentiary, it’s “terror behind the walls · solitary confinement · al capone · national historic landmark · willie sutton”. At the bottom of the page are listings for similar places. This isn’t always a good match but I doubt many people scroll down this far. For Eastern State (a 19th century prison), the similar sites are the Mutter Museum (yes!) and Historic Sugartown (not at all similar–it’s a historical society in the nearby village of Malvern). Finding this Google+ Local page is a bit tricky. On the Google Search page, click on the “Google reviews” link at the bottom of each listing (it’s usually after the Zagat rating). In Google Maps, click on the name of your site in the search results, then when the window pops-up on the map, click “more info”. 1. Know what people are saying about your site or museum online. Check Zagat, TripAdvisor, Travelpod, Yelp, and others. But don’t just read the comments–whenever possible and appropriate, respond and engage in a conversation with them (just remember, it’s all public so don’t say anything you’ll regret later). 2. Ask visitors to share their thoughts and experiences about their visit at TripAdvisor, Yelp, or Google+ Local (there is something called RateThisMuseum.com but it doesn’t seem to be active). I suspect visitors will increasingly use reviews and rankings to make decisions about travel, so ask them to help other travelers (and help you at the same time). 3. Manage your Google+ Local page and add photos, update your address and hours, and make the most of your listing. Yes, it’s one more thing to do but again, you’ll want to stake your claim before someone else does (if I tell you that you can just maintain it annually, will that convince you?). To manage your page, find the Google+ Local page for your site or museum and click the “manage this page” button (I’ve circled it in red in the above example). 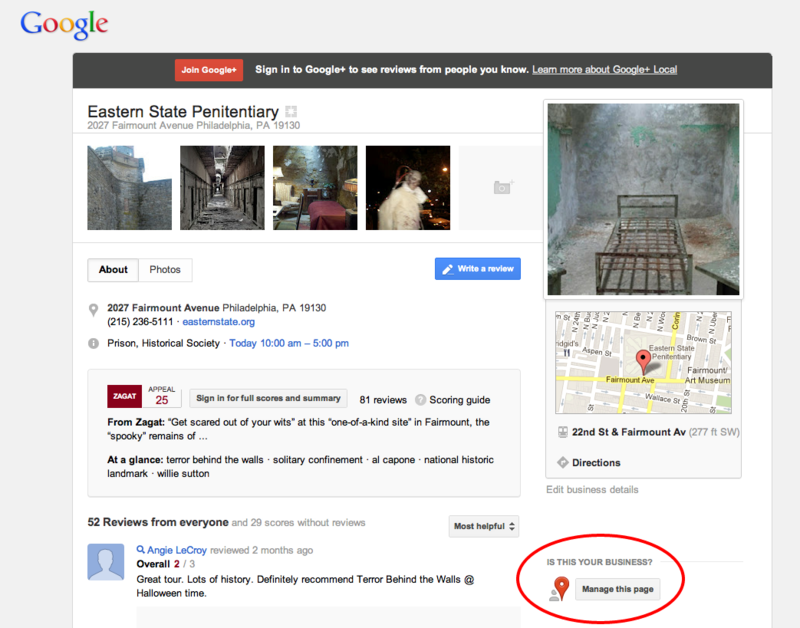 This entry was posted in Community engagement, Social media, Technology and tagged Eastern State Peniteniary, Google Places, Google+, Google+ Local, Travelpod, TripAdvisor, Yelp, Zagat on June 14, 2012 by Max van Balgooy.